MATERIALS 1. Solid pine wood frame. The edges are rounded in friction areas to increase suspension live, made with Nea elastic webbing with 10 year quality guarantee. 2. Exterior frame in iron tube with epoxy painting oven dried. Optional finish in Copper. 3. Seat cushion made with HR foam 35kg/m3 foam made of soybean oil. No solvents from oil products used. Covered with a thin layer of silicone fibre. 4. Backrest Ref. 222BU in fibre 60% synthetic Down touch and 40% polyester silicon fibre. Ref. 222BA in 25kg foam block. Design inspired by some classic early 20th century pieces. 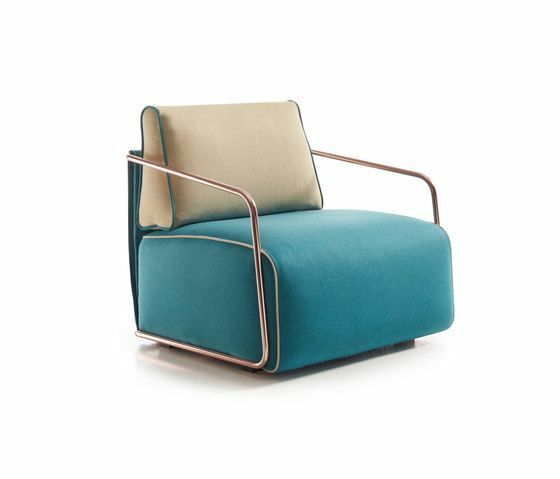 This armchair combines the feeling of great comfort, with sobriety and rigidity of a minimalist structure. This marked differentiation of materials and its simple construction makes it possible to play with different finishes and colours, making Adex easy to customize, allowing us to integrate it easily into classic or avantgarde environments.